Meet your new favorite piece of gear! Lightweight, durable & compact, this tarp will quickly earn a permanent spot in your pack. Easily set up with trekking poles or P-cord strung between trees, the Satellite tarp can be pitched in almost limitless configurations. This tarp excels as a lightweight backcountry shelter for 2, feeds 4 during meals at spike camp, or can provide much needed sun shelter on hot days at the range. An integrated hanging pocket keeps key items organized, doubles as a carry bag, and is sewn on so it won't blow away. 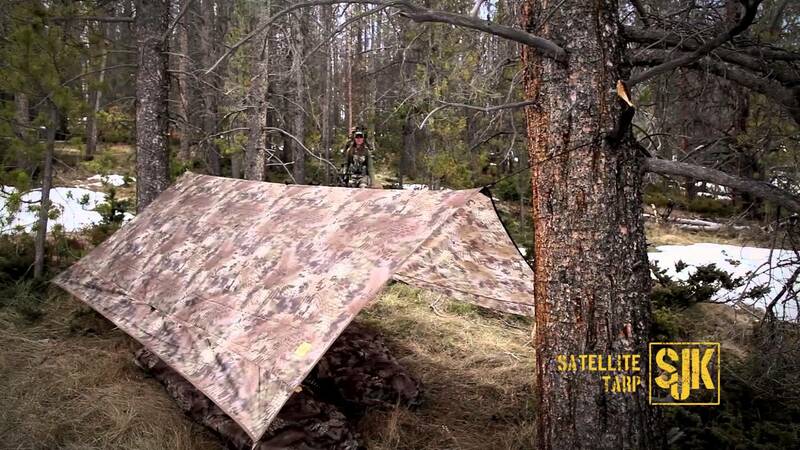 Combined with Kryptek™ Highlander camouflage, the Satellite tarp will literally help you disappear into the wild. Packed Size: 12" x 7.5" x 2.5"
A definitely must-have for every backcountry outdoorsman! Oh, and the customer service and warranty at Slumberjack is outstanding! Hunting in Alaska and Montana the weather can change quick. This tarp saved my hunt many times this last year. Absolute necessity when hunting the backcountry! Super durable and easy to set up! This tarp seems to be of very good quality and it's very light. I've not yet had the chance to field test it though. Stakes and guylines are included and are a very nice touch. Collectively the materials are all very light and take up little space in my pack. Everything you will need in basic shelter. I picked this up in September, and used it instead of my (....other brand) tarp. It's lighter, and held up really well over multiple trips. I'll be looking into some of your other gear this year! Great in rain and wind! I used this as the primary shelter for back pack elk hunt. The light weight stakes were sturdy and held up to pounding them in with rocks. The shelter held up in strong winds and rain. There was enough room for two to sleep. It also works well to wrap like a blanket while waiting out heavy rain down poor! Very cost effective for keeping pack weight light and providing the shelter you need! I take my new tarp on every hammock camping, hunting and trout fishing adventure. It has kept me 100% dry in snow, rain and wind. The Kryptek camo is just great for concealment as a back wood hunter. I took my Satellite Tarp with me on almost every hunt this year. I ended up not having to use it on most of my hunts but when the weather took a turn and it started to dump rain and snow on I was very glad that I had packed it in the bottom of my pack! Well worth the money and a must for any back-country hunter. A must for any back country hunter. Versatile in many ways, lightweight, compact, and large when unfolded. Didn't think I'd use this much, but after my first rainy trip out I decided to order another. Good work on this SJK!